What can we say that these picture don’t, after all they do say a pictured tells a thousand words.Here is Molly being assisted to sit up on Charlie in March 2015 and here she is today sitting up on her own on Cheeky Charlie! 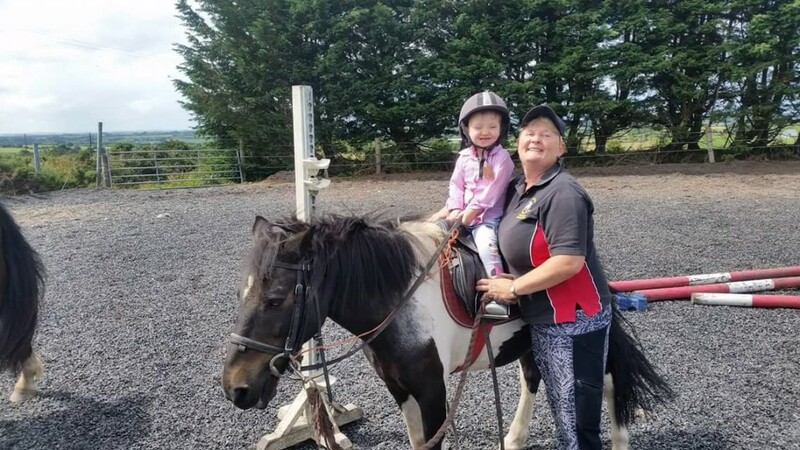 What an amazing little girl Molly is, now 7 years of age, having gone through life saving surgery and therapy to bring her to where she is now, with the help of her family, her doctors and the equine therapy she receives and loves at Capall Geal Whitechurch Equestrian centre. Equine Therapy is new to Ireland and Julia at Capall Geal has been following this type of work for many years with a passion. Telling us about this life changing therapy Julia told us, “Here at Capall Geal Whitechurch Equestrian Centre I have witnessed many miracles, such as the little boy from St. Paul’s school in Douglas who was profoundly verbally challenged and spoke his very first word during a therapy session with my very special horse ‘Stevie’, needless to say to the delight of his parents! “On another occasion a teenage boy with extremely bad coordination managed to sit up straight and canter this amazing horse with my assistance. “Children with autism also benefit immensely from equine therapy due to the motor, emotional and sensory sensations that comes with riding a horse. “I can tell lots more positive stories but why not give it a try yourselves? For thousands of years the bond between humans and horses has proven to be effective in creating an emotional healing bond.” To find out more, or to make an appointment and see for yourself, contact Julia on 086 2312372.